I can remember as a child making shortbread for my dad. I seem to think he loved eating shortbread and so I decided to make it for him. I have no idea where I got the recipe from, but it looked and tasted like the boxed shortbread we bought at the shops. It has been many years since I made shortbread for my dad and I should check with him if it is still his favourite tea time snack. In December I received a gift of a book to chronicle my kitchen adventures from yuppiechef. While I am sitting watching TV an idea will pop into my head about a recipe I want to make, and now I can write it down straight away. To me, basil and strawberries are a taste sensation match, and as soon as I had made my strawberry sherbet I decided to make some basil shortbread’s to go with them. I chose to adapt the recipe from James Martin’s The Collection but as you can see here from my review of James’s Desserts I had to adjust the baking temperature and time. Often when using fructose I have to make some changes to the heat I use, as fructose burning point is lower than that of sugar. These shortbread had a lovely lingering taste of basil, and they have kept very well in an airtight container. did you ever make something special for your father when you were a child? I really must try this recipe. Yummy! Hi Tandy, I love te look of these shortbread and the addition of basil is right up my street. I’m trying to think up some strawberry creation to go with it as they are such a good match like tomatoes. I’ve never tried basil in a biscuit – now intriqued. Let me know if you do try it Sally! Hehe I used to make things that my parents thought were strange or unfamiliar to them! So I guess I did the opposite to you! 😛 This shortbread looks lovely and buttery! I love that you did that Lorraine! Maybe I should try something new and unusual on them when they come and visit? 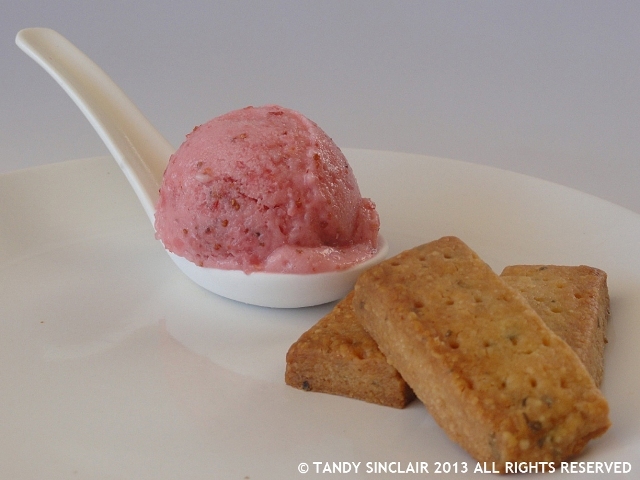 I love shortbread and the basil infusion is such a fun twist! It makes is have an interesting depth of flavour! How did the move go? Great idea Tandy! I’ve had a basil crust once but this shortbread looks terrific. I love using savory herbs in desserts! This looks tasty. I will have to try this one 🙂 Looks really nice. I have some basil growing outside right now and now I’m doubly excited for it!! I like the idea of using basil in shortbread, especially after trying Colleen’s bay and citrus shortbread recipe at Christmas time. I’ll have to try this one soon, even if it is ages till strawberry season comes round again. Never thought about basil in shortbread before – sounds lovely.